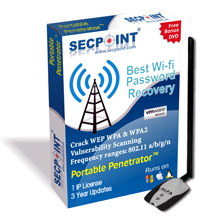 Portable Penetrator PP4000 Professional Wifi Key Recovery Software. PP4000 is the best software for doing a wifi audit on your own or your clients network. Discover is they are open and vulnerable to attack. Find out if they have already been compromised. You will get professionally PDF reporting with the results. Report branding is allowed upload your own Logo, Watermark and company name. There is also a language option to customize the reports for different languages. More than 10+ languages are supported at this time. Always check the latest software version to see if more language is supported. Further more you can identify vulnerabilities on your network with the vulnerability scanner and assessment module.